Marcus Law believes Kettering Town must be wary of a wounded animal as they prepare for a trip to Alvechurch on Saturday. The Poppies return to Evo-Stik League South Premier Division Central duty looking to maintain their impressive start which has left them on top of the early table after six wins from their first seven matches. 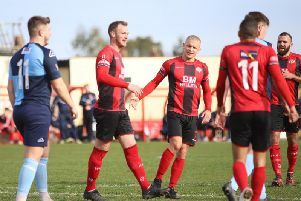 Their only setback so far came in the form a 2-1 home defeat to Leiston but they bounced back from that last weekend with a 2-1 victory over AFC Mansfield to move into the third qualifying round of the Emirates FA Cup. At the same time, Alvechurch were on the end of a 4-1 defeat at the hands of Corby Town as Steve Kinniburgh’s Steelmen upset higher-ranked opposition on their own pitch. Law believes that loss will only make Alvechurch even more dangerous this weekend. But the Poppies are set to be boosted by at least one new signing ahead of the game while their suspension and injury problems appear to be easing with full-back Dion Kelly-Evans being the latest to return from a ban on Saturday. “I am sure Alvechurch will be hurting, it sounded like Corby put in a particularly good performance last weekend,” Law said. “They won’t be happy, they may well ring the changes and adapt things to put it right. “I am sure they will have had a look at us but we will have our own gameplan. “It’s that time of the year where you are switching between the league and cups and it’s important that when we have our league matches, we make sure we try to keep the position we have. “It was pleasing to get the win last weekend after the loss in the league but I don’t think that defeat really affected the players badly. “From the outside looking in, people will have seen a manager who was just making excuses. “But the truth is, we had five players who started the first game of the season missing against Leiston and then we lost Brett Solkhon during the match itself. Both Aaron O’Connor and James Brighton remain long-term absentees due to knee injuries. Striker O’Connor, who hit 40 goals in all competitions last season, suffered his serious injury at the end of pre-season and has been targeting a comeback next month while Brighton is not likely to be back in contention until November. Both players have been seen doing some light work on matchdays and Law added: “Aaron has been having an intensive week of treatment this week. “Physios tend to look at the worst case scenarios while players always look at the best so there is a bit of distance between what the two parties believe at the moment. “Either way, it won’t just be a case of throwing him straight back into it. We will have to work him back in the team."